Apart from the famous compositions “Krishna Nee Begane”, “Pibare ramarasam” and “Bhavayami Gopalabalam”, Yamuna Kalyani is elaborated by musicians during concerts only in viruttams/shlokas usually under the pretext of lending a “Hindustani” touch to the musical proceedings. I present two of them. First, Sangita Kalanidhi Semmangudi Srinivasa Iyer interprets Yamuna Kalyani in this shloka rendered as a ragamalika, to the violin accompaniment of Vidvan Lalgudi Jayaraman on the violin, in this very good recording from a live concert, circa 1960. Incidentally in this concert, Semmangudi Srinivasa Iyer sandwiches this raga between two solid “carnatic” ragas, Dhanyasi and Saveri in this ragamalika rendering of the shloka, ‘kOdanda dIksha gurum’. ( See Foot note 4). In this exposition it may be noted that Sri Srinivasa Iyer does not render the raga in madhyama sruti. He starts of on the gandhara note, the jeeva svara of Yamuna and ornaments it with a prolonged kampita gamaka. Note that when he finally concludes his essay he ends it on gandhara only . He reaches out to the tara sadja via jaaru from the pancama and travels on to the taara gandhara as well and does uses the suddha madhyama sparingly. The prati madhayama as one notices is also muted and he uses only nRGP. Also he focuses only on the purvanga svaras and never pauses on /uses the nishada or dhaivata as a nyasa-start or ending svara even as he conjures up his vision of Yamuna Kalyani. The version that the veteran paints has predominantly shades of the older archaic Yamuna with suddha madhyama thrown in as well. Attention is invited to the gamaka laden murccanas/akaaras that Sri Semmangudi weaves with his well warmed up voice, imparting the so called ‘Carnatic’ charge to this apparently northern raga! We next move on to the rendering of a viruttam by Sangita Kalanidhi T V Sankaranarayanan (TVS), as a prelude to the kriti “Krishna Nee”. He uses Yamuna Kalyani to present the pAsuram (verses) of Tirumangai Azhwar on the Lord at Tiru Allikkeni (Triplicane, Chennai). Sri Sankaranarayanan’s presentation is reminiscent of Prof TRS’s style, marked by fidelity to sruti, open throated and unrestrained felicity in the execution of sancaras in the top octave. Another old composition that is rendered in Yamuna Kalyani is the javali ‘Adhi Neepai’ of Dharmapuri Subbarayar, which again is rendered in madhyama sruti, in the modern version of the raga. The version as rendered by the doyenne of the Dhanammal family, Smt T Brindha may be referred to. The archaic Yamuna Kalyani melodically equivalent to Suddha Kalyan of Hindustani Music as evidenced by the gavai prabandha (Foot Note 1) and Subbarama Dikshitar’s jatisvaram. The Yamuna Kalyani of Dikshitar as embodied in the composition “Jambupate” with alpa suddha madhyama prayoga (restricted to GM1R or GM1GR) and nishada being vakra in arohana, melodically equivalent to Yaman (purists may prefer the nomenclature Jaimini Kalyan for this) of Hindustani Music. The much more modern and lighter sampurna version of Yamuna with more/denser suddha madhyama usage (even used in quick succession following the prati madhyama note) and ornamented with more jaarus and less of kampita gamaka. Many of the modern day expositions of even older compositions such as Tyagaraja’s beautiful piece “haridAsulu vEdalE” or “Vidhi chakra” fall within this ambit. And as a first among equals in this listing, the composition and the conception of the raga Yamuna Kalyani therein, by themselves exemplify the greatness of Dikshitar and his monumental contribution to our music. Tenaka – an optional attribute for a prabandha .This is not seen in this prabandha instance. Svara- The dhatu is available as required. Since the prabandha (with tattaittaiyaa -GGGR, as the refrain or udgraha) has 4 components including the mandatory svara part, it is a Anandini Jati prabandha. One can surmise that since this prabandha had been composed in a desya raga of northern origins, it was probably treated as a slightly inferior composition. While one can always speculate on Dikshitar’s choice of ragas for some of his great compositions, his choice of Yamuna for “Jambupate” is very intriguing. “Jambupate Maam Pahi” is a krithi which forms part of the set of 5 compositions covering the pancabhuta kshetras namely Kancipuram (prithvI), Kalahasti,(vAyu), Tiruvannamalai (agnI) , Jambukeshvaram (jala/appU) and Cidambaram (AkAsa), wherein Lord Siva is said to embodied in the form of one of these primordial elements. Each of these kritis in unique and has been custom structured lyrically having a solid nexus to the kshetra. Jambukeshvaram or tiruvAnaikkA, the kshetra on which this kriti has been composed, represents Shiva of the form of Water. Hence this composition features a number of water related references such as Ambu, Ambudhi, Ganga, Kaveri, Yamuna, Kambu, appU etc. The lyrics also features the standard dviteeyakshara prasa, the usage of which Dikshitar is justly famous for such as, Jambu-ambu, tumbu, ambu, kambu etc). To showcase his musical virtuosity by taking up a desya raga and providing a make-over to it and in the process bring it into the musical mainstream in Carnatic Music. Suddha Kalyan as a raga is considered a challenge to musicians in Hindustani Music. This is what Deepak Raja says on this point. Dikshitar associated Yamuna with Trichy/ Jambukesvaram. Given that the prabandham (the oldest available composition) is on a ruler of Trichirapalli, Dikshitar associated it with the Tiruvaanaikka temple and proceeded to compose in it. In fact King Vijayaranga Cokkanatha was a great benefactor of the Tiruvanaikka temple as well. Additionally one can surmise as well that Dikshitar might have heard the prabandham being rendered when he was in Trichirapalli , had it notated, which latter came into the hands of Subbarama Dikshitar, who proceeded to publish it in the SSP. The famous British Photographer Linnaeus Tripe took these photographs of Trichirappalli and the Jambukesvara Temple , perhaps just a few decades after Dikshitar visited the temple. Dikshitar must have walked through the temple courtyard and the approach street as one sees in the photograph above. 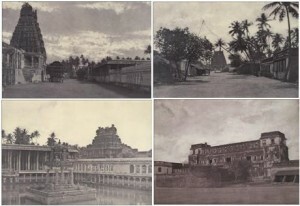 The photo on the bottom right is the ramp parts of the Trichy Palace/Fort as it was then. This Palace was probably the Court of King Vijayaranga Cokkanatha, where perhaps the Yamuna Kalyani gavai prabandha was composed and rendered, with him as the nAyakA. Time and again one can notice that whenever there is a conversation about Dikshitar’s composition “Jambupate”, the lyrical and melodic structuring of the composition on the lines of the Northern/Hindustani Dhrupad is invariably referred to. Dhrupad in short it is an old and now virtually extinct compositional form and vehicle for musical exposition of Hindustani Music. For an in depth coverage of dhrupad I would refer the readers to the book by Deepak Raja ,titled ‘Hindustani Music – A Tradition in Transition’ . There are apparently 2 types of Dhrupad’s in the northern classical music – the so called devotional dhrupad, which is typically sung in Vaishnavite temples of the North and the second one being classical dhrupad. This is what author Selina Theilemann says of the 2 types of dhrupad ( or dhruva pada) in her work “Singing the Praises Divine: Music in the Hindu Tradition”, which I think summarizes it perfectly. In all probability Dikshitar structured his ‘Jambupate’ on the lines of the northern ‘devotional drupad’. Did he hear it in a northern Vaishnava shrine, probably during his Kashi sojourn? Or did he perhaps hear it being rendered by some visiting ‘durbari gavai’ in Tanjore or Trichirapalli? No one can be sure. Be that as it may, Dikshitar invokes the deeply meditative and contemplative structure of the devotional dhrupad in this composition. The similarities ‘Jambupate’ has with the devotional dhrupad also give us a clue as to how the composition has to be rendered and there can be no doubt about it. Selina Theilemann’s summary of the style/tempo of rendering the devotional dhrupad says it all. As an aside, attention is invited to the remarks that Sri Srinivasa Iyer makes at the start of Sri Lalgudi’s vinyasa response. Semmangudi Srinivasa Iyer known for his humorous and witty on/off-stage remarks and repartee, given that the raga being rendered is of Hindustani origins, in this clipping, expresses his appreciation for Sri Lalgudi Jayaraman’s raga response with the Hindi words ‘acchA acchA’ and then follows up with a comment to the effect that (given that the “Anti Hindi’ agitation was running high in Tamil Nadu then i. e during the early 1960’s) the usage of “that” Hindi word is best avoided! The entire concert has been commercially released by Carnatica through a CD album titled “Classical Everest”. Ramachandran K.V. (1950) – “Carnatic ragas from a new angle – Sankarabharana” – The Journal of the Music Academy XXI, pp. 88-99, Madras, India. “Desi ragas of Post-Ratnakara Period” ( 1996) – Ph.D Dissertation of R Hemalatha, Department of Indian Music, University of Madras, Chennai, India. The clippings in this article have been used for purely educational purpose as illustration only and all copyrights therein lies with the music distributors or the artistes or their descendants as the case may be. I am extremely grateful to Dr. Abhiramasundari for providing me with with her interpretation and permission to use the rendering of the jatisvaram of Subbarama Dikshitar. I thank Vidvan Suryaprakash for providing me with the permission to post his rendering of the Yamuna Kalyani kriti ‘Paramashivatmajam’, from his CD release titled “Shanmatha Sunadham” distributed by Poornima Records, Chennai.